Outfits For Mums. As a mother myself to a 1 year old, I can definitely relate to those first mornings were you wake up, get your baby ready, older kids ready for school, breakfast, bags the list goes on and if you’re really lucky you might just get a shower without those little people raiding the bathroom. From jeans and T-shirts all the way to maxi dresses and wedge heels the potential for mums out there is phenominal. Don’t forget that contrasting colours and sizes can work in your favor. An over sized top over skinny jeans can look amazing and do your figure a great favour. The oversized top are great for mums who are a little bit selfconscious about their bodies while the skinny jeans will give a confidence boost. Maxi dresses are great for every size and shape and so are a fantastic choice for all mums, self conscious or not. They are perfect for summer and spring wear, perfect for the city and perfect for the beach, their versatility is astronomical! So what about footwear that is both easy and stylish? Well, as a mother, I go more for practical shoes which have a fashionable image. If you’re a fan of heels then why not go for a pair of wedges? These are ideal for matching with maxi dresses or jeans so can be used with most outfits. Flats can consist of ankle boots and high top trainers. Simple and practical but give an more modern feel and will make your whole outfit look up-to-date. Even for casual outfits, a handbag, a chunky necklace and even sunglasses can change the look of your outfit and can make a simple style look a million dollars! Be daring with accessories, play with them, they are an important part of all outfits and are an easy way for mums to look and feel better. 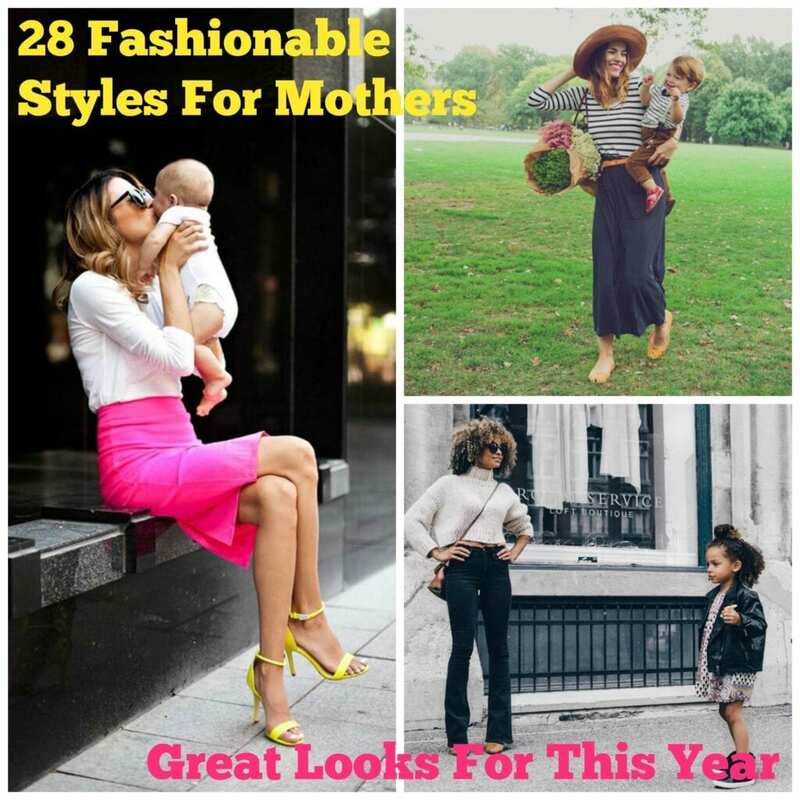 Have a look at the following images and create your own awesome and fashionable mum look. #28- Cara Loren Casual Look. Striped baggy top with ripped skinny jeans and white trainers. Accessorise with shades and handbag. #27- Great Autumn Combo for mums on the school run. Scarf, jumper, cream jeans and brown knee high boots. #26- Gorgeous Spring look for mums. Stripey top with maxi skirt and sandals. Simple and stylish. #25- Beautiful look for the practical mum. Pink jumper with blue leggings and brown leather heeled ankle boots. Accessorise with chunky necklace and silver jewellery. #23- Great combo for mums for a stylish look with stripes, black and white tones and wedge heels. #22- Victoria Beckham has the stylish mother looks down to a T. Simple black maxi dress with plain black flip-flops looks amazing. #21- Great casual style for mothers. Floral sleeveless blouse with cropped skinnies and brown peep toe heels. #20- Gwyneth Paltrow rocks the casual mum look. Plain blouse, jeans and brown flats. #19- Miranda Kerr looks stunning in this white maxi dress with flip-flops and contrasting black handbag. Super easy and stylish style for mums. #17- This business style mum looks amazing in a neon pink skirt and white blouse. Finished with shades and contrasting yellow heels. #16- Simple and effective with cropped jumper and high waist skinny jeans. Accessorise with brown pumps and handbag. #15- Cute matching mum and daughter outfits. Black and white with polka dots always looks sophisticated. #14- Kate Middleton has one of the top spots in mum fashion. She always looks sophisticated and all her styles are easy to recreate. #13- Great winter look for mums this year which is both practical and stylish. #12- Love this simple style for plus size ladies this spring. Denim jacket and simple white top with black maxi skirt. #11- A great look with a black poncho for curvy ladies. Gorgeous look and easy for mums to execute. Knee high boots make legs appear longer! #10- Casual yet sophisticated combination for mums. #9- Easy mum summer style with stripes and bold red skinnies. Gorgeous and fun look. #8- For the working mums out there, a stunning business style look with tartan skirt and black boots. #7- A simple look which most mums will be familiar with. Check shirt and jeans. Such a great and easy way for mums everywhere to look amazing yet still keep it real. #6- Beach style combination for mums this year. Turquoise and denim colour palette. #5- Again Kate Middleton shows us mums how simple garments can look stunning. The black suede boots really make this outfit speak for itself. #4- Victoria Beckham keeps the mum look simple with a plain t-shirt, skinny jeans and high heels to add a bit of a twist. #3- Simple combination for curvy ladies for summer with neutral tones. #2- French Summer Style. Beautiful navy blue top with skinny denim pedal pushes completed with denim boat shoes.